I still remember the moment when I realised I’d made a serious mistake. Sometimes you push your luck too far, don’t think hard enough about risk, or whatever, and suddenly realise just how precarious your predicament has become. 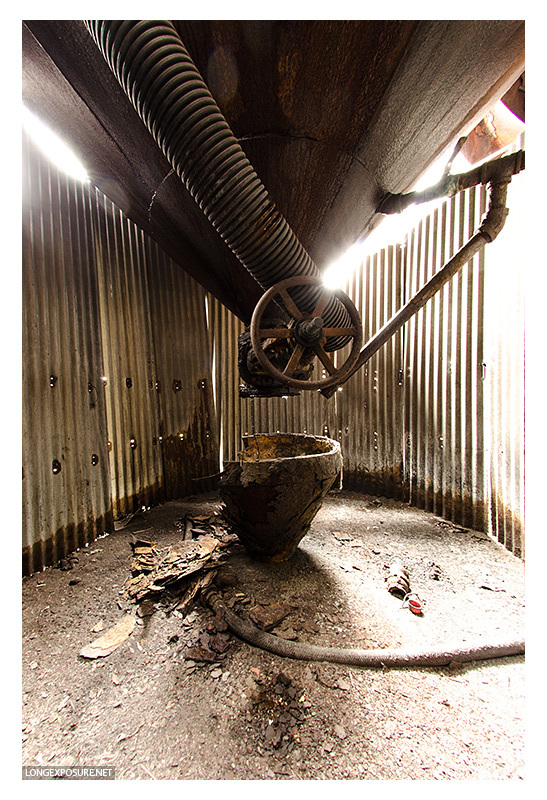 It was cold, it was very wet, and an abyss of rusted metal jutted upward to greet me from where I stared down in horror. 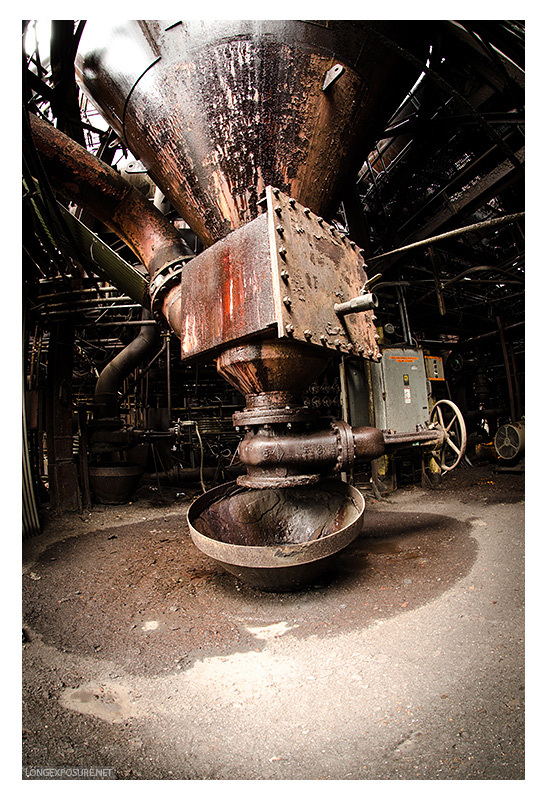 In what had once been a sprawling steel mill, I’d ascended a labyrinth of pipes and gantries, water dripping off me, and damp rust smeared over everything. I’d long since lost my road trip companions elsewhere in the complex, and heavy cloud and drizzle made the world grey, quiet and subdued. My boots crunched chips of rust into checkerplate steps, and I moved cautiously, ever-aware that this entire place was a precarious palace of corroding metal. Hands on pipes or rails when possible. Feet placed gently. Three of the four of us would, by the end of the day, comment in somewhat shaken terms that we’d put a foot through something. I was not the odd one out. I spotted something interesting ahead of me, off the main platform via catwalks: a half-rusted metal vessel spilling its own sides onto the ground. In hindsight, that a solid metal object had rusted away so badly was probably an indication of just how far gone this facility was. I moved onto the catwalk. I felt my foot go through the expanded mesh of the catwalk and tightened my hand on the handrail alongside. 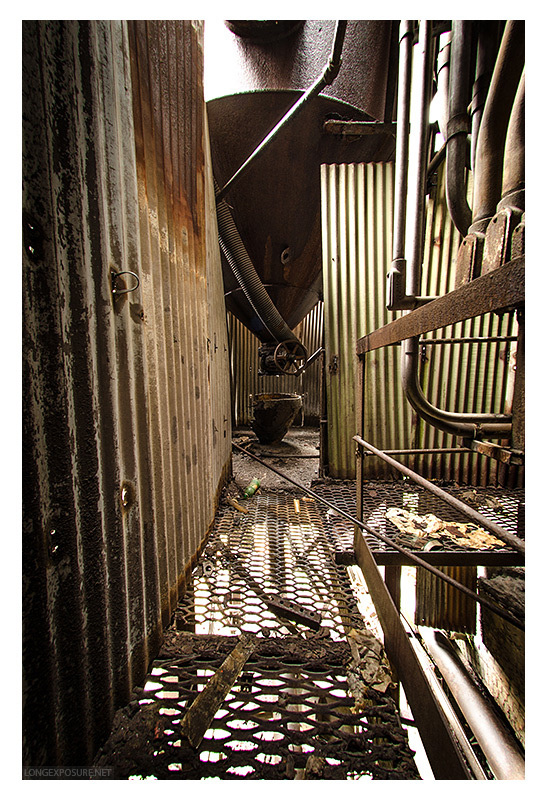 Foot suspended, I shifted my weight, watching pieces of rusted shrapnel scatter below me into a vertical maze of cold, wet industrial detritus. But I was fine, hands on rails, redundancy wins again. Instead of stepping onto mesh again, I surveyed the catwalk, and realised there was a big, solid beam underneath, which supported the entire stretch. I stepped on it, and both heard and felt it crack and fold underneath me. With every muscle in my body tensed, realising that the beam supported everything I could possibly reach, I held my breath. The beam sagged, broken where my foot sat. My fingers tightened in futility on handrails that no longer provided redundancy. Very, very slowly, I began to back up, cringing as I took my foot from the break point, and made my way as carefully as I could back to the main platform. I don’t think I breathed at all until I was standing on it, looking back at the broken catwalk, and trying to grasp having just dodged a serious bullet. I took a while for the adrenaline to back off and for existence to return to normal. Sympathy is hard to come by, though. I related my tale to my companions, and had two serious knowing nods from those who’d had similar, while our fourth just laughed and called us suckers. To be fair, I’d probably have done the same.